I show you how to get a juicy, tender Instant Pot Chicken Breast. From a fresh or frozen skinless/boneless chicken breast. Pressure cooker chicken breasts are a fast, easy, and healthy recipe. Pressure cooking has become very popular again, with the invention of the Electric Pressure Cooker. Namely the Instant Pot®. I started using it over two years ago, and I can’t believe how many things I can cook in it! 1. For best results, weigh the chicken breasts. You can add up the weight and cook for an averaged amount of time (a little less than 1 minute per ounce). 2. Rub the chicken breasts with a little olive oil. 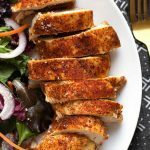 I tested this method and I think it helped the Instant Pot Chicken Breast stay moist and tender. 3. Use the trivet/rack to keep the chicken breasts above the water so they don’t boil. 4. Use a Meat Thermometer to check for doneness. 5. The best results with this method is for chicken breasts from about 5 to 10 ounces, and about 1 1/2 inches thick. If one end is a lot thicker, just pound it with a meat mallet, heavy wood spoon, or rolling pin, to thin it a bit. To Brine or Not to Brine Instant Pot Chicken Breast? I like to brine my skinless/boneless chicken breasts before I bake them in the oven. It makes a big difference in the juiciness. The average time I brine a chicken breast is about 30 minutes. I did several tests with brining chicken breasts prior to pressure cooking them, but I couldn’t see much difference from those I didn’t brine. So I don’t brine them for pressure cooking. You can if you want, and you can also marinate them, which is great for flavor. The only time I brine before pressure cooking is when the chicken breast is frozen. Though it isn’t really brining as much as it is thawing the outer layer. I just put the chicken in a dish of warm water with a couple Tablespoons of salt in it for about 10 minutes. Then rinse it and continue. Can I cook Frozen Chicken Breasts in the Pressure Cooker? Yes you can! The only thing I do differently is soak them in a few cups of warm (not hot) water for about 10 minutes, then pat dry with paper towels, and then rub on the oil, and then the spices. This will help the outer part of the chicken breast thaw a little so the spices stick. 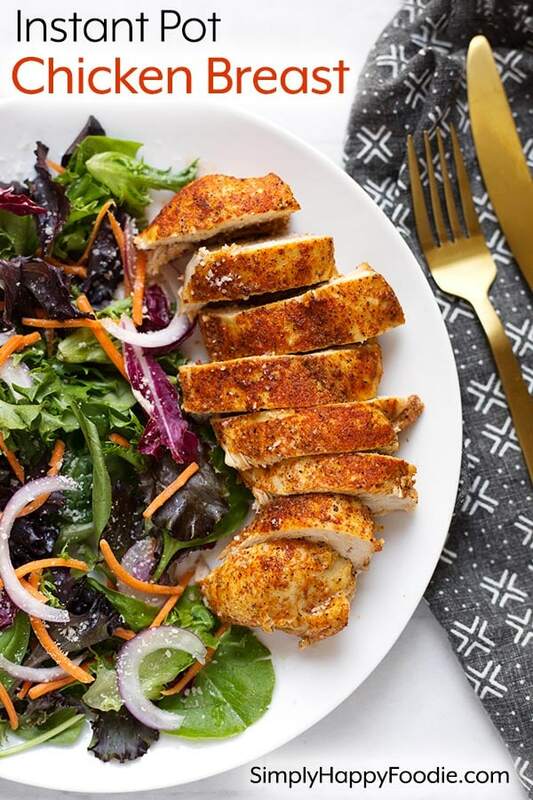 How long to cook an Instant Pot Chicken Breast? Since chicken breasts come in many sizes, I can’t give you one set amount of time that will cook them all the same. Nobody wants a rubbery chicken breast, so it’s important to cook them based on their weight so they don’t overcook. A food scale is very helpful for cooking chicken breasts. I cook a 8 oz chicken breast for 7 minutes at high pressure, and a 10 minute natural pressure release. That’s a little less than 1 minute per ounce of weight. When I’m cooking several breasts at one time, I cook for the average weight. Also, don’t overlap them because the parts that overlap may not fully cook. I show you how to get a juicy, tender Instant Pot Chicken Breast. From a fresh or frozen skinless/boneless chicken breast. Pressure cooker chicken breasts are a fast and healthy recipe. Pour the water into the inner liner of the pressure cooker. Set the trivet/metal rack in the pot also. Rub the chicken breasts with the olive oil. 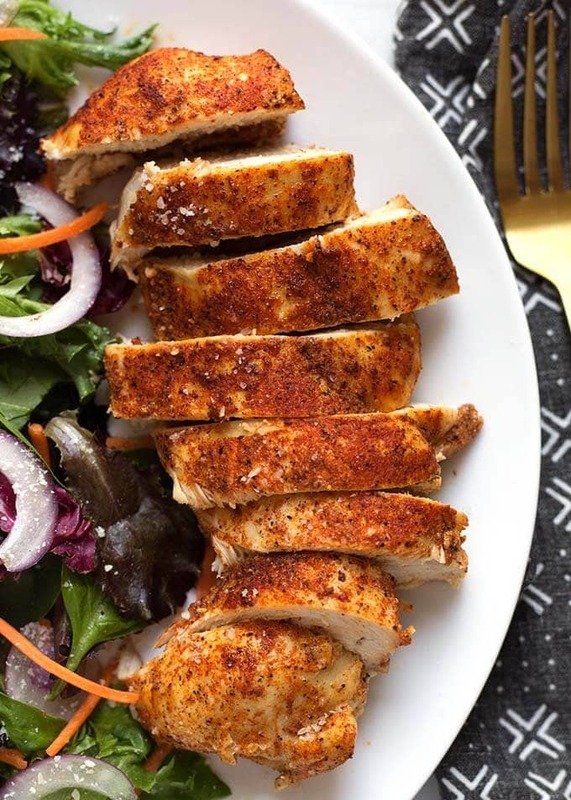 Rub the spice rub on all sides of the chicken breasts. Set them on the trivet/rack in the pot. 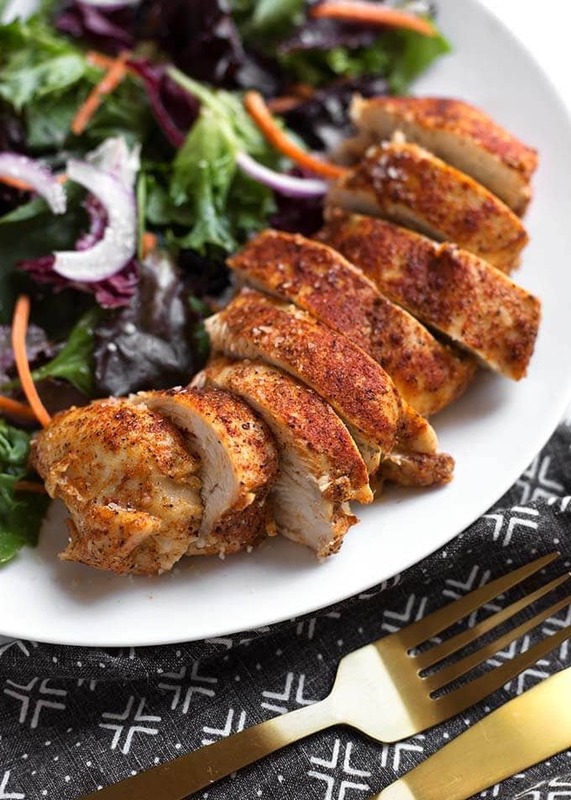 Try my Baked Chicken Spice Rub. Press the Pressure Cook (Manual) button or dial, and then the +/- button or dial to select 7 minutes for an 8 oz breast, (a little less than 1 minute per ounce). If cooking multiple breasts, set time for the average size (High Pressure). When the cook time is finished, let the pot sit undisturbed for 10 minutes (10 minute natural release). Then manually release any remaining pressure/steam. Open the lid and take the temperature with a meat thermometer. It should read at least 160° and will cook a little more as it rests. Remove the chicken to a plate and let rest 5-10 minutes, tented with foil, before cutting it as this will help it retain its juices. 2. Rub the chicken breasts with a little olive oil. I tested this method and I think it helped the chicken breast stay moist and tender. 3. Use the trivet/rack to keep the chicken breasts above the water so they don't boil. My chicken breasts never turn out in the Instapot. I tried this recipe and they were perfect, not rubbery at all. I can’t believe it. Almost gave up. Thank you. Hi Chris! Noone wants rubbery chicken breasts! I’m so glad my method worked for you! Did you try my spice rub, or did you season them another way? Thank you, Angela! I’m so glad it worked for you! 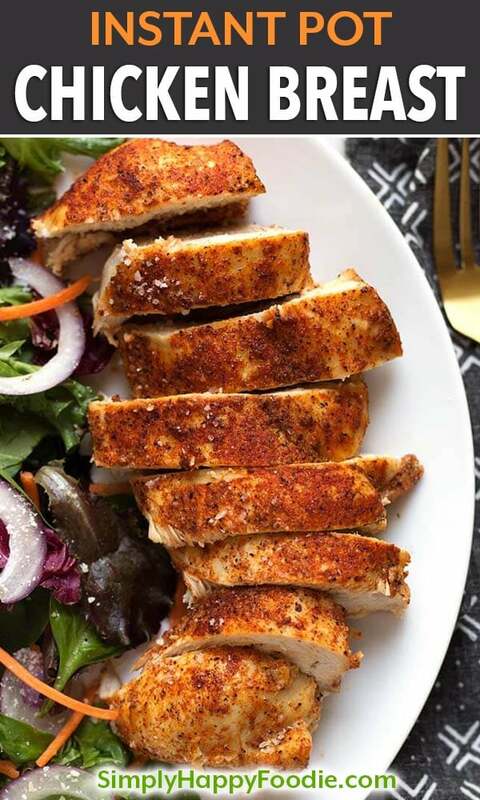 Awesome recipe, I’ve tried different recipes for chicken breast and always end up dry, but this one was different so juicy and tender. My husband who doesn’t really like chicken breast loved it! I cut two large breasts in half. Each half weighed about 8 0z so, would cooking time for all 4 half breasts be About 7 min? Sorry I’m a bit confused on this. Just think 1 minute per ounce. Average the individual pieces. So you have four 4 oz pieces. Cook for 4 minutes with a 10 minute NR.